Monks bless the crowd at a human rights demonstration in Phnom Penh. 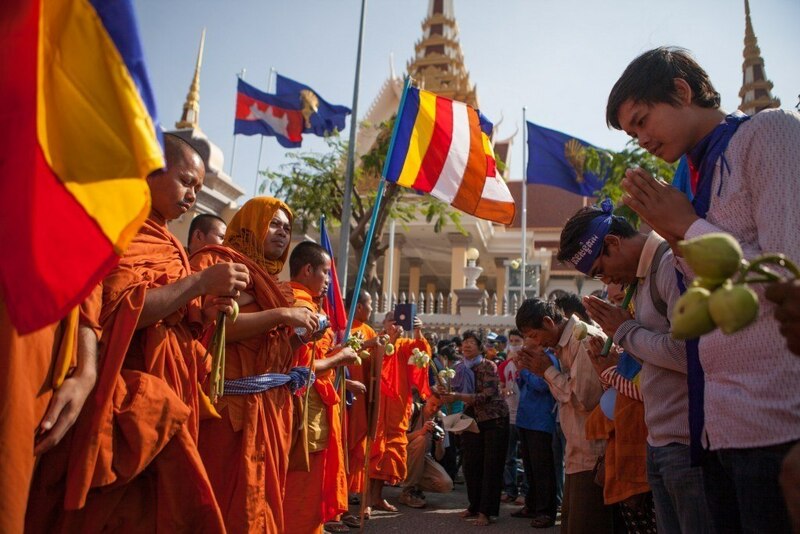 A month ago, I stood outside Cambodia’s National Assembly with hundreds of Buddhist monks. They chanted in Sanskrit and tossed lotus petals into a crowd of protesters, blessing them. Many of them had walked from rural villages to Phnom Penh over 10 days. 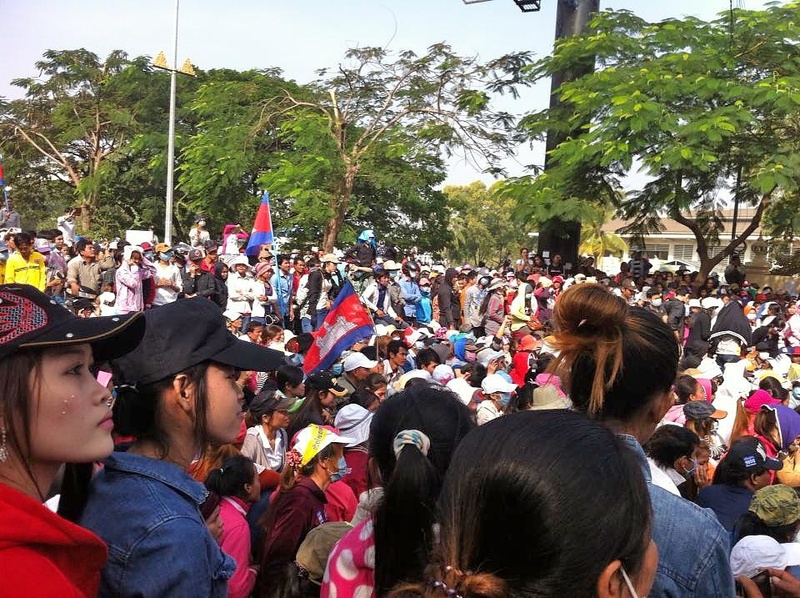 They rallied at the palatial seat of the country’s parliament, to mark International Human Rights Day and hopefully draw the government’s attention to the rights Cambodia’s people have yet to fully grasp—rights related to labor, land and a fair legal system. People passed out water bottles and wrapped towels around their heads to protect themselves from the harsh midday sun. Others held up signs (“WE ARE WOMEN WE ARE NOT SLAVES”) and loudspeakers buzzed, ready to call people to action. We were not supposed to be there; the government had prohibited marches. I searched the crowd, waiting for something to happen. But it was peaceful. Despite a day filled with marches and demonstrations, Phnom Penh remained relatively calm. The only government reaction: quietly relocating a dozen protesters who had camped outside the U.S. embassy. Fast forward a few weeks, and the demonstrations have taken a dramatic and deadly turn. On Jan. 2, after escalating tension over the minimum wage, police shot AK-47s and handguns into a crowd of protesters, killing at least four and injuring more than 29. 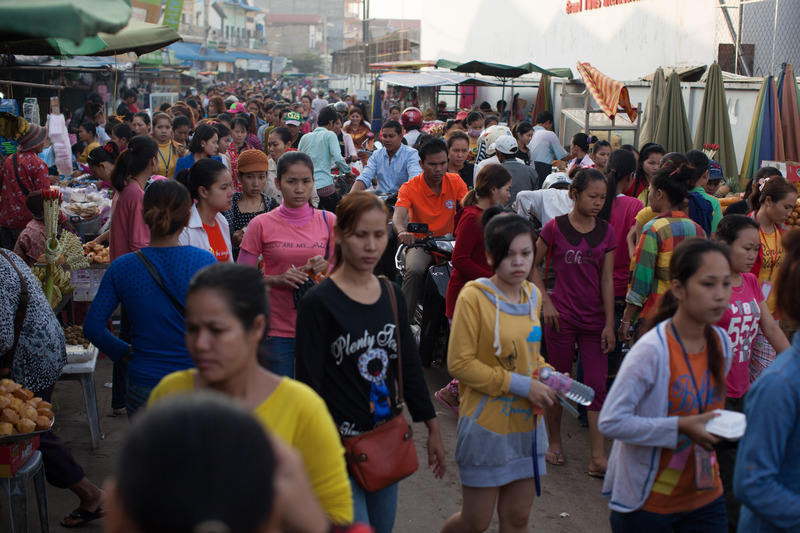 Most of them were garment workers—the very people I traveled to Cambodia to meet. 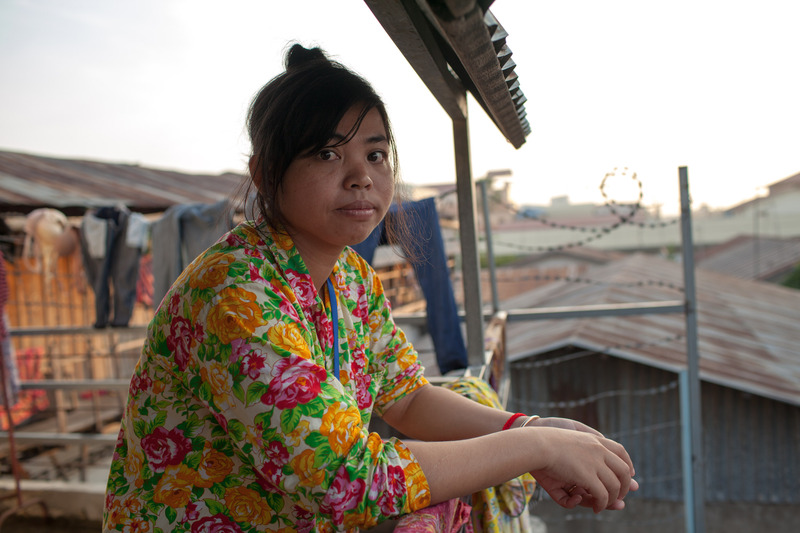 Win, a garment worker, outside her home in Phnom Penh. It’s a warm morning in early December, and Win is showing me what life in Phnom Penh on $80 a month looks like. That’s less than $3 a day, and it’s the minimum wage for garment workers in Cambodia. For Win, it means living in a tiny cement room that fits a wooden pallet about the size of a queen bed, a sink area for cooking and not much else. Most garment workers share these spaces, where four to six people live. Like Win, most of them begin working in the factories as teenagers, around age 15 or 16. Outside the room, I hear the gentle splashing sounds of sarong-wrapped women washing their hair by the stairs, scooping and pouring the water from buckets. There is nowhere else to bathe. Inside, Win or one of her roommates has decorated the bars on the single window with hair clips. Someone has arranged a thicket of red incense like a bouquet in a jar, and taped up posters of puppies and pop stars on the walls. As Win gets ready to leave, she bustles around the small space in her pajamas, which are covered with printed flowers. So many of the factory girls wear them here, both in and outside the house; it’s become a fashion trend. I’m here with a freelance photographer to talk to Win and other community organizers from Workers Information Center (WIC), a grassroots group that American Jewish World Service has supported since 2010. WIC is run by and for women garment workers. They make up about 90 percent of the garment industry in Cambodia, which is the country’s largest source of export earnings. The women of WIC support each other, sharing key information about labor rights and talking about the latest issues they’re experiencing at work. Their goal is to gain negotiating skills and advocate for their rights in the factories. 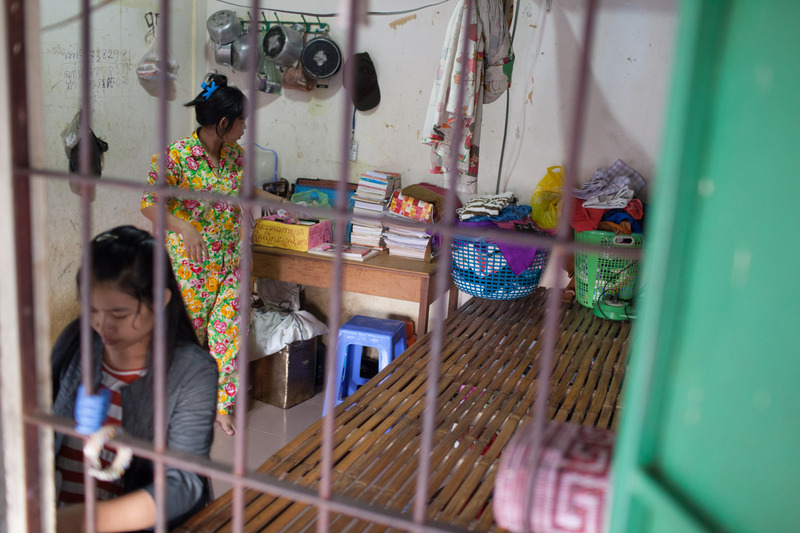 Win gets ready for her day in the room she shares near a Phnom Penh garment factory. Cambodia’s traditional culture expects women to do as they’re told and to not speak up, whether facing a cruel manager or a demanding parent. Phong, a WIC community organizer, told me that it’s typical for men to run the labor unions in the garment factories. The unions organize periodic strikes, putting pressure on the factories to increase wages or improve working conditions, but the leaders aren’t necessarily inclusive or interested in the concerns of the female workers. Win, who also educates her peers as a WIC organizer, tells me it’s also typical for women who work in garment factories to support their families, sending home up to half of their pay each month. I asked her why these strong women—who take on so much responsibility—rarely speak up for themselves or take on leadership roles within the unions. It’s a pattern that upsets her. In addition to the squalid housing, many of the women suffer from a host of challenges in the factories: long hours; short labor contracts that weaken job security; sick leave that’s almost impossible to take because it requires clinic visits no one can afford; bosses who make threats for unfair reasons, like a woman opting not to work overtime; heat and fabric-conditioning chemicals that have led some women to pass out or get sick; and loud machines that can cause hearing damage. 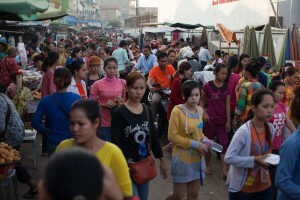 Young women fill the streets near a Cambodian garment factory. “The thing I hate most,” Win says, “is the forced overtime for pregnant women.” Right up until their (brief) maternity leave, pregnant garment workers are typically working—and likely on their feet—from about 7 a.m. to 8 p.m. Monday to Friday, then 7 a.m. to 4 p.m. on weekends. WIC’s multiple drop-in centers throughout the garment worker neighborhoods offer places where the women can find support. The center staff are there to talk women through their problems and refer them to reproductive care and other services when needed. The confidence and negotiating skills that women develop at WIC often make waves in their personal lives, too. Phong tells me that WIC has radically shifted how she feels about herself and her abilities. Phong, along with several other women from WIC, takes night classes designed to help her finish high school. To arrange this, she had to negotiate with her mother, who wants Phong to get married as soon as possible. But that’s not what Phong wants—not yet, at least. She is 21. 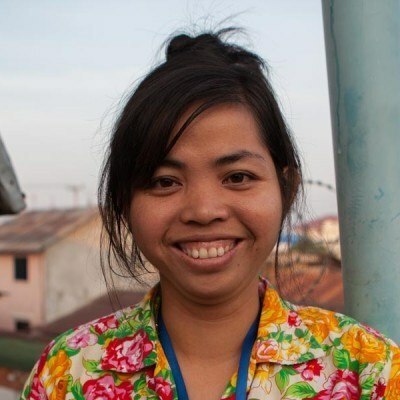 She doesn’t want to work in the garment factory for the rest of her life. Phong, in blue, talks with other garment workers about their rights. I ask Phong what she’s hoping her work with WIC will accomplish. What does she want people to know? What does she want to change? The international media did cover the struggles of Cambodia’s garment workers—but only when their strikes turned into demonstrations that the Cambodian government couldn’t ignore. On Dec. 24, the labor unions started to strike, asking for double the minimum wage: $160 a month. On Dec. 25, most of the garment factories shut down as more workers took to the streets to demand a livable wage. On Dec. 29, thousands of garment workers gathered outside the Cambodian Ministry of Labour to demand a minimum wage of $160 a month. Photo credit: Thareth Sok. Then the factory workers merged with the opposition party, and tens of thousands of people flooded the streets of Phnom Penh—but not just to demand a better wage. They questioned the flawed elections that brought Hun Sen, the Khmer Rouge defector who has served as Cambodia’s prime minister for 28 years, another term in office. They demanded his resignation. Then the violence started. Police opened fire on the crowd, reportedly responding to protesters who resisted efforts to break up the demonstrations, some of whom threw homemade explosives and set fire to vehicles. (Some have suggested that the instigators were thugs hired by the government, but this has not been verified.) Soldiers wielding AK-47s continued to patrol areas where garment workers live, entering their homes and breaking up any gathering of more than two people. 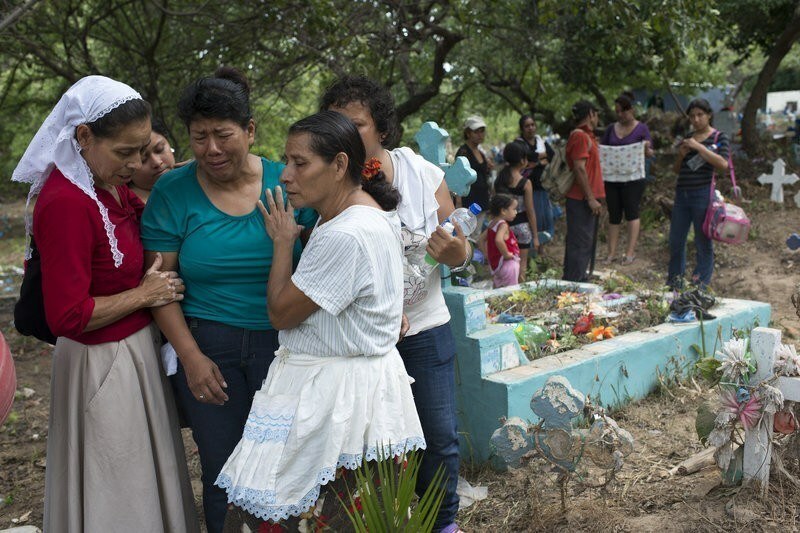 Most people living in the area where police opened fire fled for their villages, fearing for their lives. (The neighborhood includes the Vattanac and Canadia industrial parks, which produce garments for H&M, Adidas and Puma.) In a country where, just a few decades ago, the Khmer Rouge regime killed more than a million of its citizens—through starvation, torture and execution—any kind of state-sanctioned violence can create panic. In recent days, many garment workers have returned to work. What will happen next is hard to predict. However, you can do something. Chrek suggested U.S. consumers take action by researching the brands they purchase and contacting the companies whose garments get manufactured in Cambodia, calling on them to ensure fair wages and conditions for the factories they use. 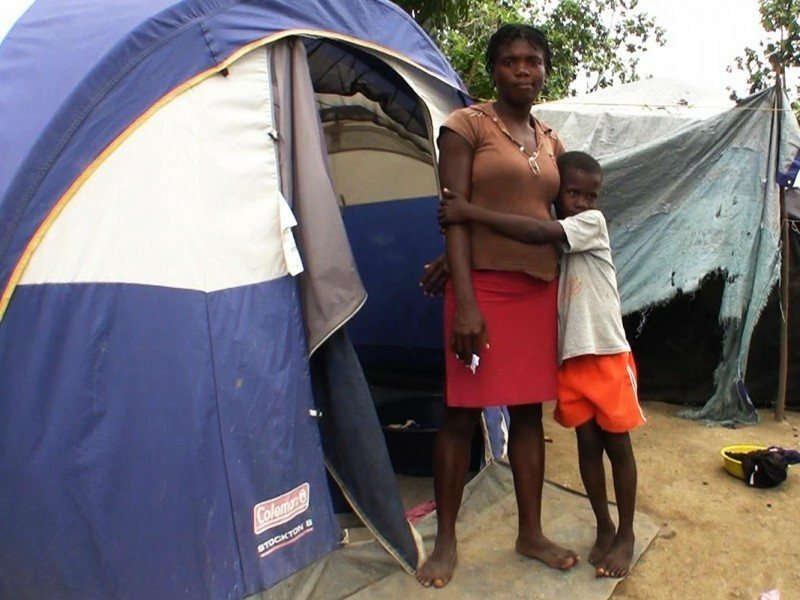 Take Action: You can support advocacy efforts like this community petition, which calls on Prime Minister Sen to protect people’s right to peaceful protest in his country. 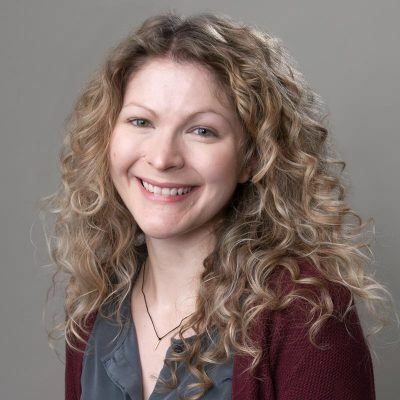 Elizabeth Daube is a communications officer for American Jewish World Service. 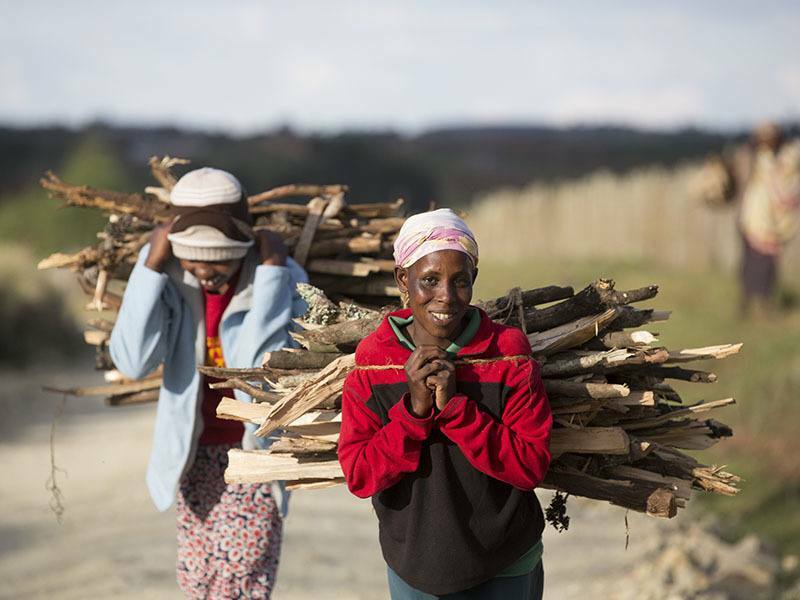 All photographs by Evan Abramson for AJWS, with exceptions noted.